Monday 8 April: NLI Reading Room and Manuscript Room closed all day to facilitate Library's redevelopment of the premises. Venue: National Library of Ireland, Kildare St., Dublin 2. All other services/exhibitons/cafe, including Genealogy Advisory Service, operate as normal. Monday 8 April: What the newspapers wrote about my family, with Michael Parkinson. Host: NIFHS, Newtownabbey branch. Venue: Drama Theatre, Glengormley High, 134 Ballyclare Rd, Newtownabbey. Free. 7pm. All welcome. Monday 8 April: Online family and local history resources, a workshop. Host and venue: Public Record Office of Northern Ireland (PRONI), Titanic Boulevard, Belfast. The 2-hour workshop includes an orientation tour of PRONI and introduction to online resources. 11am. Free. Need to book. Tuesday 9 April: Using court, prison and coroners’ records, with Wesley Geddis. Host: NIFHS, Lisburn branch. Bridge Community Centre, 50 Railway Street, Lisburn, BT 28 1XP. Free. 7:30pm. All welcome. Wednesday 10 April: Armagh County Museum – a resource for local studies, with Sean Bardon. Host: North of Ireland Family History Society, North Armagh Branch. Venue: Bleary Community Centre, 1 Deans Road, Bleary, Craigavon, Co Armagh, BT66 7AS. Free. 7:30pm. All welcome. Wednesday 10 April: The lives and correspondence of three C18th-sisters: Katherine Conolly, Jane Bonnell and Mary Jones, with Dr Gabrielle M Ashford. Host: Royal Irish Academy, 19 Dawson Street, Dublin 1. No booking required. All welcome. Free. 1pm–2pm. Wednesday 10 April: The Augustinian Church, Dungarvan, a walk and talk with William Fraher. Host Waterford County Museum Walk & Talk at 3 series. Meet at Waterford County Museum, St Augustine Street, Dungarvan at 3pm. Free. All welcome. Wednesday 10 April: A Cultural Revolution: the Last Years of Donnybrook Fair, 1855-1868, with Fergus A D'Arcy. Host and venue: Pembroke Library, Anglesea Rd, Ballsbridge, Dublin 4. 1pm. Booking essential T: +353 1 6689575 E: pembrokelibrary@dublincity.ie. Thursday 11 April: First World War nurses: the Northern Ireland connection, with Margaret Graham. Host: Western Front Association, Antrim and Down Branch. Venue: Public Record Office of Northern Ireland, 2 Titanic Blvd, Belfast, BT3 9HQ. 6:30pm to 8:45pm. All welcome. Thursday 11 April: Mary Elmes, the Irish Schindler, with Mark Elmes. Host: Rosscarbery & District History Society. Venue: Celtic Ross Hotel, Rosscarbery, Co Cork. All welcome. Thursday 11 April: Macardle Moore & Co Ltd. Host: Old Dundalk Society. Venue: Louth County Museum, 8 Jocelyn St, Townparks, Dundalk, Co. Louth, 8pm. All welcome. Thursday 11 April: Using early maps to explore local history and heritage – a midlands perspective, with Dr Arnold Horner. Host: Offaly History. Venue: Offaly History Centre, Bury Quay, Tullamore (beside Tullamore DEW), Co Offaly. All welcome. €2 members/€5 non-members. Teas, coffees and cake after the meeting. Friday 12 April: Titanic together, a tour of PRONI. Hosts: PRONI, Belfast Titanic Society, Belfast City Council, Titanic Foundation and Titanic Belfast. Venue: PRONI, Titanic Boulevard, Belfast. Visitors will see Harland & Wolff and other historic maritime related material in the Reading Room, see the Reprographics and Conservation areas and visit the stores. Free. Book here. Saturday 13 April: The Irish Revolution – local or global? a History Ireland Hedge School with editor Tommy Graham, John Borgonovo, Fearghal McGarry, Darragh Ganno and Linda Connolly. Host: Cobh Readers' and Writers' Festival. Venue: Cobh Library, Arch Building, Casement Square, Cobh, Co Cork. 3:30pm. All welcome. Saturday 13 April: Soldier marriages in garrison towns, with Dr Aoife Breathnach. Host: Irish Genealogical Research Society. Venue: Dublin City Library & Archive, 138-144 Pearse Street, Dublin 2. 2pm to 4:30pm. Lecture follows AGM. Non-members may attend AGM but only members can vote. The lecture is free and all are welcome to attend. Saturday 13 April: Irish Saturday – free assistance from IGSI members. Host and venue: Library, Minnesota Genealogical Center,1385 Mendota Heights Rd., Mendota Heights, Minnesota, USA. 10am to 4pm. Saturday 13 April: Using Google for Irish family history research, a workshop with Anne Johnston. Host: Venue: NIFHS Resource Centre, Valley Business Centre, 67 Church Road, Newtownabbey, BT36 7LS. 11am to 4pm (one-hour lunch break 1pm-2pm). Fee: £14. Details. Saturday 13 April: Irish women of action, a panel discussion. Host: New York Irish History Roundtable. Venue: McCloskey meeting room, Parish house of the Basilica of St. Patrick’s Old Cathedral, 263 Mulberry Street, Manhattan, New York, USA. 2 p.m. Reception to follow. Suggested donation: $5. Details. Monday 15 April: NLI closures: All services/exhibitons/cafe, including Genealogy Advisory Service, closed until 11am for staff meeting. Main Reading Room and Manuscript Room remain closed all day to facilitate Library's continuing redevelopment of the premises. Venue: National Library of Ireland, Kildare Street, Dublin 2. Monday 15 April: Women of the Somme, with Carol Walker. Host: NIFHS, Larne branch. Venue: Larne Bowling & Tennis Club, 112-120 Glenarm Rd, Larne, BT40 1DZ. 7:30pm. Free. All welcome. Monday 15 April: What's New in Irish family history, with Chris Paton. Host: Glasgow and West of Scotland Family History Society. Venue: Gilchrist Theatre, Kelvinside Academy, Kirklee Road entrance, Glasgow, Scotland G12 0SW. 7:30pm. Members free. Non-members £1 on the door. Tuesday 16 April: The Boyne in Medieval Myth and Literature, with Dr Clodagh Downey. Host: Meath Archaeological and Historical Society. Venue: Navan Library, Railway St, Dillonsland, Navan, Co. Meath. All welcome. 7pm. Tuesday 16 April: Are we there yet? Irish genealogy online, with John Grenham MAGI. Host and venue: National Archives of Ireland, Bishop St, Dublin 8. Free. 6pm. No booking. All welcome. Tuesday 16 April: Commandant Joe Barrett (1888-1971), leader of the mid-Clare Brigade, and his newly discovered archive, with Dr Paul O'Brien. Host: Clare Libraries. Venue: DeValera Public Library, Harmony Row, Lifford, Ennis, co Clare. 6:30pm. Free. All welcome. Wednesday 17 April: The Vikings in Ireland, with Dr John Sheehan. Host: Kilmurry Historical and Archaeological Association. Venue: The Heritage Room, Independence Museum, Kilmurry, Co Cork. 8pm. All welcome. Members free. Non-members €5. Wednesday 17 April: Widows and the 1641 Depositions, with Professor Jane Ohlmeyer. Host: Institute Association of Professional Historians. Venue: National Library of Ireland, Kildare Street, Dublin 2. 7pm. All welcome. Friday 19 April: Cave Hill and the United Irishmen, with John Gray. Host and Venue: Clifton House, North Queen Street, Belfast, BT15 1ES. 1pm–2pm. Booking advisable, T:028 9099 7022. Fee: £6.50, cash only. All welcome. 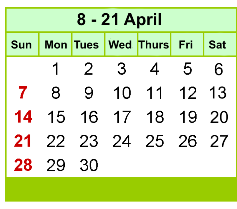 Friday 19 April: Good Friday, a public holiday in all but name in the Republic of Ireland. All librairies and archives closed until Easter Monday inclusive. In Northern Ireland, Good Friday is not an official holiday and most repositories will be open (they close instead on Easter Monday and Easter Tuesday).